Last weekend the Forever Always Retreat was held in the bushy suburb of Turramurra. The venue was located in the bush and while I was there I couldn't believe I was only 20 minutes from my house in the busy city! I taught two classes to the lovely ladies attending the retreat. The double layout class was well received, everyone created beautiful layouts and included approximately 12-13 photos on their pages. 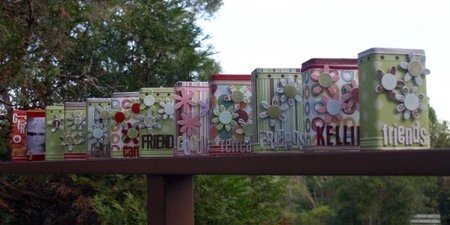 The altered tin class was fun, a chance to make something different whilst using our scrapping supplies. I always love seeing how the one class can yield such a variety of gorgeous projects. Here's a picture of all our tins neatly lined in a row (I was trying to be creative, lining all the tins in a row, taking photos from different angles, etc...). Sonia has lots more photos from the retreat on her blog. Sonia has a photo of a gorgeous card in her post, which she gave me when I left the retreat. Thank you Sonia! It was nice to catch up with my friend Narelle, who travelled from Nevertire (near Nyngan). She drove eight hours to attend the retreat! I'd like to thank Sonia for asking me to teach at her retreat, I thoroughly enjoyed creating the lesson projects and teaching the ladies. And to the gorgeous ladies attending, it was lovely to meet you, thank you for being fantastic students! It was a pleasure teaching all of you! I'm teaching at the Forever Always Retreat this weekend, in the bushy north shore of Sydney. 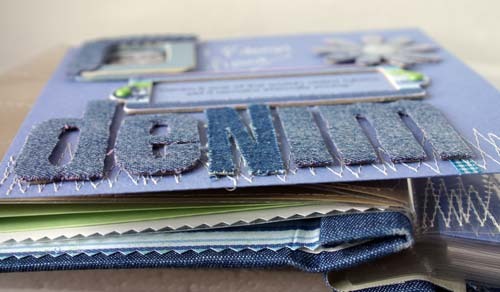 I'll be teaching two classes on Saturday; one double layout class and an altered project class. Looking forward to seeing and meeting the lovely ladies going on the weekend. A big box was delivered yesterday afternoon. Love these big boxes, I've had them occasionally before. 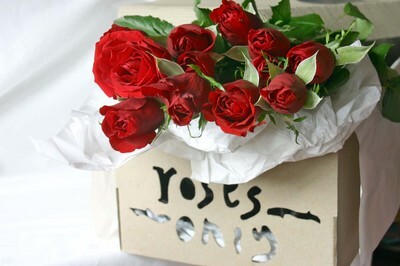 It contained most gorgeous smelling, rich red, long stemmed red roses. The rose smell filled the house immediately. The girls were intrigued by this mysterious delivery. "Do you think it was daddy who sent them?" Anyway, it occurred to me as I was taking a few photos of my gorgeous roses that I was half way through my "a photo a day" challenge. What a way to mark the day! I'm very excited to be in my first circle journal group. 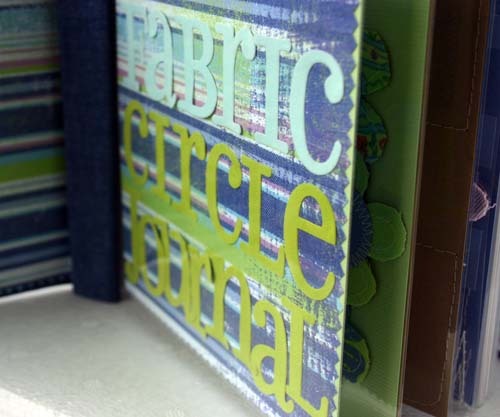 I've been scrapbooking for over five years, and I'm only just starting the circle journal journey. My theme is, "if you were a fabric, what would you be?" It was inspired by the Autumn Leaves Designing with Fabric book. 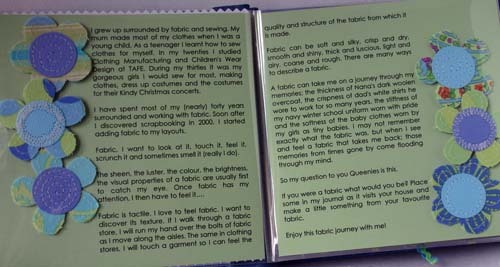 I love the bio page in this book where the contributors to the book write about what fabric they would be. I've used a Print Blocks denim 6"x6" album. 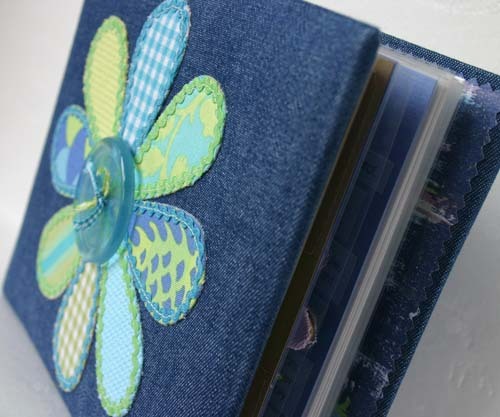 The cover is decorated with Amy Butler fabrics, coloured Aida cloth and gingham fabric. There's a really big Bazzill Button in the middle. Baby rick rack from my store. 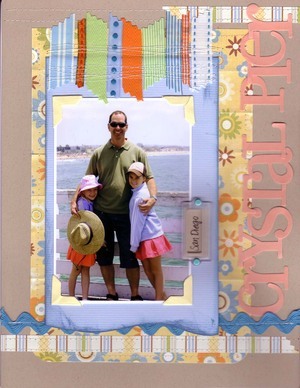 Title page uses Junkitz papers and Making Memories velvet letter stickers. 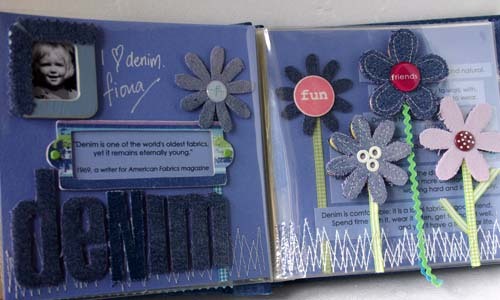 The front and back inside covers are also covered with the Junkitz papers. A little detail from the introduction page. Amy Butler fabrics again. 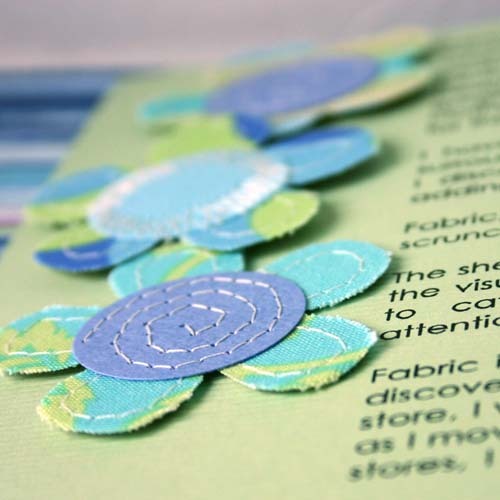 Here's a peek of my first page...... it is part of a little double layout. Just sharing a layout for our US album (from our trip last year). This is the second "smaller" size layout I've created (you'll have to wait to see the first - no too long I hope). I'm enjoying the smaller size format, and looking forward to creating more. Papers are by Chatterbox, the title uses the Making Memories Velvet alphabet stickers. All the ribbons are from my store. The idea of the "photo a day" albums has always appealed. I do like to look around the blogs which have these albums. I'm not sure if there are any rules. If there were rules, I'd probably break them anyway. I've also decided I'm going to do more things for me, rather than producing projects for specific purposes. 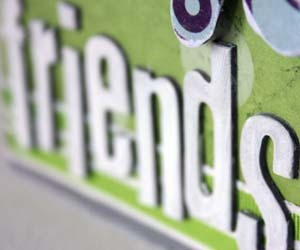 So the first of these "doing it for me" projects is to keep "A Photo A Day" album for February. I figure one month, and a short one at that, is achievable. At the end of the month I'd like to create a layout with all the "everyday" pictures I've (hopefully) taken. It will hopefully give a snapshot of "us" for the month. I'm also using this album to make me practice using my camera. I am off to a good start. February 1's photo is in the album!